Background: Traditional Chinese Medicine (TCM) is widely utilized as complementary health care in China whose acceptance is still hindered by conventional scientific research methodology, although it has been exercised and implemented for nearly 2000 years. Identifying the molecular mechanisms, targets and bioactive components in TCM is a critical step in the modernization of TCM because of the complexity and uniqueness of the TCM system. 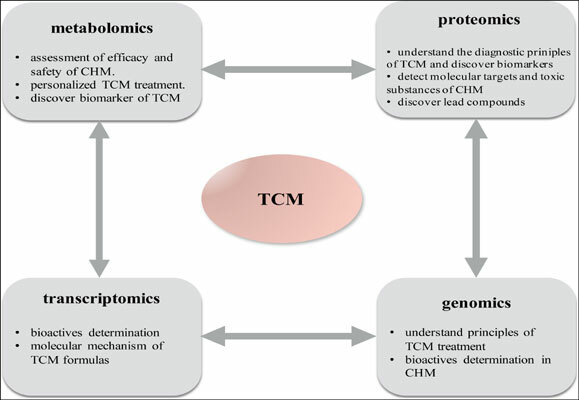 With recent advances in computational approaches and high throughput technologies, it has become possible to understand the potential TCM mechanisms at the molecular and systematic level, to evaluate the effectiveness and toxicity of TCM treatments. Bioinformatics is gaining considerable attention to unearth the in-depth molecular mechanisms of TCM, which emerges as an interdisciplinary approach owing to the explosive omics data and development of computer science. Systems biology, based on the omics techniques, opens up a new perspective which enables us to investigate the holistic modulation effect on the body. Objective: This review aims to sum up the recent efforts of bioinformatics and omics techniques in the research of TCM including Systems biology, Metabolomics, Proteomics, Genomics and Transcriptomics. Conclusion: Overall, bioinformatics tools combined with omics techniques have been extensively used to scientifically support the ancient practice of TCM to be scientific and international through the acquisition, storage and analysis of biomedical data. Keywords: Traditional Chinese Medicine (TCM), bioinformatics, system biology, omics, metabolomics, biomarkers. Keywords:Traditional Chinese Medicine (TCM), bioinformatics, system biology, omics, metabolomics, biomarkers. Abstract:Background: Traditional Chinese Medicine (TCM) is widely utilized as complementary health care in China whose acceptance is still hindered by conventional scientific research methodology, although it has been exercised and implemented for nearly 2000 years. Identifying the molecular mechanisms, targets and bioactive components in TCM is a critical step in the modernization of TCM because of the complexity and uniqueness of the TCM system. With recent advances in computational approaches and high throughput technologies, it has become possible to understand the potential TCM mechanisms at the molecular and systematic level, to evaluate the effectiveness and toxicity of TCM treatments. Bioinformatics is gaining considerable attention to unearth the in-depth molecular mechanisms of TCM, which emerges as an interdisciplinary approach owing to the explosive omics data and development of computer science. Systems biology, based on the omics techniques, opens up a new perspective which enables us to investigate the holistic modulation effect on the body.